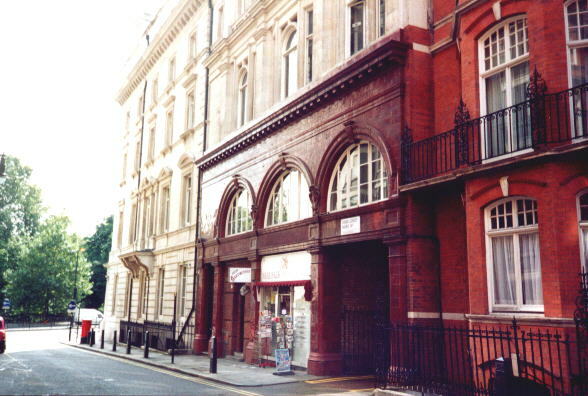 Located on the Piccadilly Line between Green Park and Hyde Park Corner, Down Street station opened 15/03/07, but was never heavily used, due to a combination of it being located in affluent Mayfair and its entrance being tucked away in a side-street after which it is named, off Piccadilly. It was last open 21/05/32, but was used as secure accomodation during WW2 by both Churchill and the Cabinet (prior to the completion of the Cabinet War Rooms), and the Emergency Railway Commission. The platforms were walled off to provide office space, with a small section left open to enable train passengers to alight via the driver's cab. This "mini-platform" can be briefly glimpsed on the right-hand side of trains passing between the two open stations. 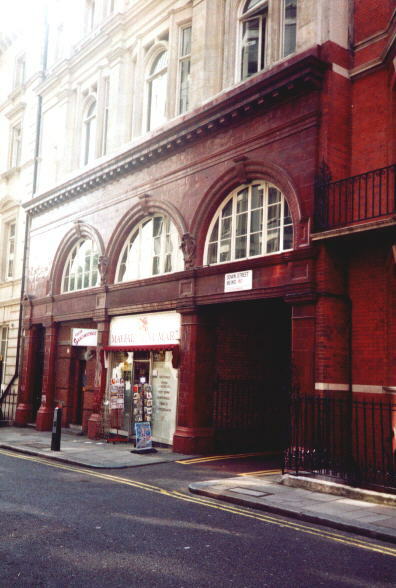 Seen here in September 2000, the ground floor was occupied - as it has been for many years - by a newsagents shop.